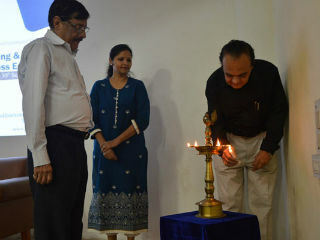 The inaugural session began with lighting of lamp by the Guest of Honour-Mr. Pavan Chaudary, Director- Dr. S.K.Goyal and the Deans. This was followed by welcome address by Dr. Preety Wadhwa, where she highlighted how Digitisation is important for academic fraternity. 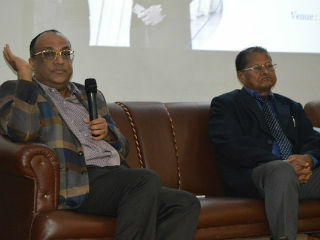 Dr. S.K.Goyal welcomed the guest and also highlighting the need for such FDPs. 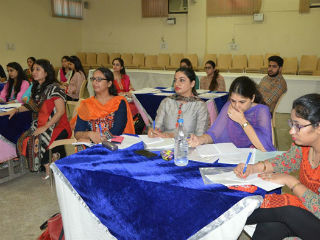 Dr. Pavan Chaudary shared that a teacher should be far more knowledgeable than students. He enthralled the audience by sharing the stories of Sharad Agarwal and Raju Bhatnagar and inspired them with his term like ‘Dharah Pravah’, ‘Maxims and Counter Maxims’ were eye openers. 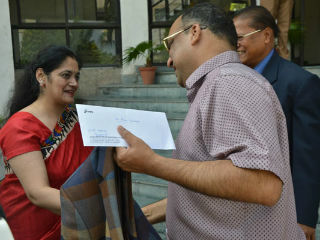 Finally director sir felicitated the guest. After tea break there was a power packed ice breaking session, which began with a story of an ‘Eagle Rebirth’ to highlight the need and importance of such a programme. 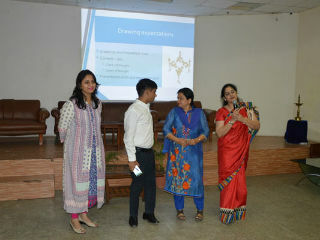 This was followed by a small briefing by Dr. Preety regarding the objectives of the session titled “Drawing Expectations”. 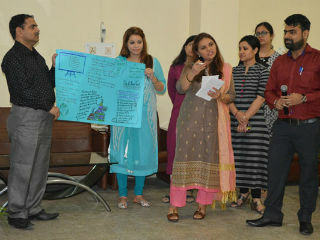 Faculty were divided into three groups and they worked in teams to draw expectations from the FDP. 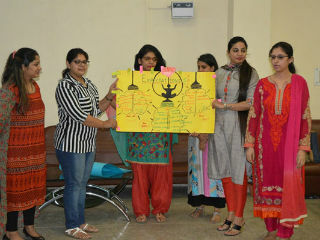 This was presented by each team with creativity expressed in the form of colourful pictures, flowcharts and diagrams they made on chart papers. These were then displayed in the event venue and each group was given five minutes to explain the same. 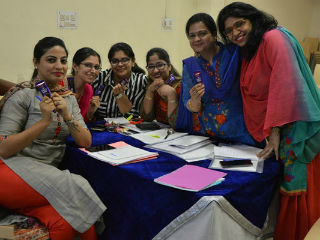 The activity was full of energy and the judges comprised of one member from each group to reduce bias. 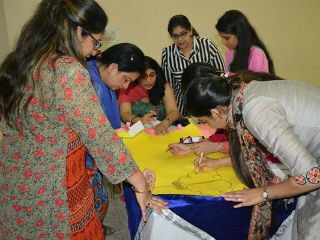 The session was fun-filled as all participants displayed child-like enthusiasm in expressing their creativity on paper. 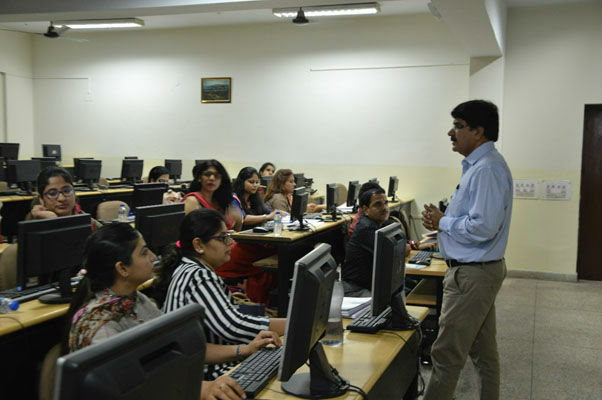 The session was conducted in Computer Lab by Dr. R.K.Sharma. SPSS is a Windows based program that can be used to perform data entry and analysis and to create tables and graphs. It is capable of handling large volume of data and can perform all of the analyses covered in the text and much more. SPSS is commonly used in the Social Sciences and in the business world, so familiarity with this program serves researchers’ needs. Since the topic was extremely important for participants who were in different phases of their research work, there was an active participation in the session. He explained a complex topic flawlessly by giving references of characters from the epic ‘Mahabharata’. 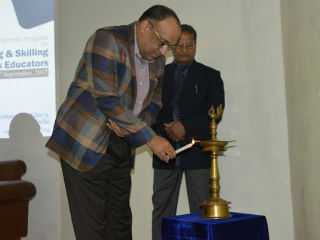 His concepts of ‘Dasha-Disha-Darsha’, ‘Dew-Few’ and unique use of synonyms by linking them to the title of the session, spell bound the participants and he was given a standing ovation by the participants. He talked about different conflict management styles that can be learned from nature by giving references of different animals and their conflict management styles. Prof. Mashkoor Zafar highlighted the importance of Big Data and Business Analytics. He highlighted that 21st century is regarded as the age of information technology, thus ability to use data and information in real time has become a key to success of any and every organization. Dwing to recent revolution in internet technologies, the amount of information generated every second is enormous. Today no matter what business or industry one is in, the critical parameter to make rational business decisions is nothing but access to quick information. But here he emphasized that participants must understand that the real power does not lie in the data and information itself, the key lies in changing those Petabytes of data in some valuable products and services. And here lies the power of business intelligence tools. He introduced a few such tools to participants and explained how these tools could be used in teaching, learning and research processes. Yoga and meditation when practiced together strengthen the mind body connection, improving overall fitness and well-being. Many styles of yoga combine meditation with the physical routines, which use controlled breathing throughout the yoga poses. Yoga Guru Piyushji explained and demonstrated that one can meditate without practicing yoga by simply relaxing, clearing one’s mind and concentrating on controlled breathing. He explained that both yoga and meditation, when used consistently, have proven health benefits. 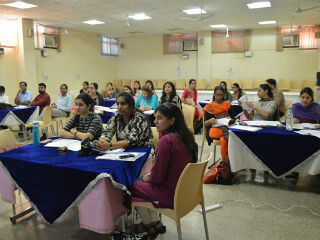 This session was also well appreciated by participants. 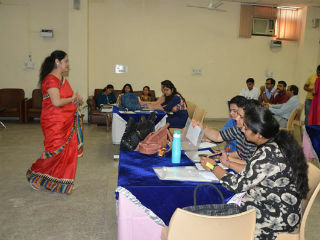 Dr. Namita Rajput explained the inception and use of ‘Massive Open Online Courses’ to the participants. She encouraged them to start MOOCs in their respective areas of specialisation and also guided them about how to start with this career. She gave them information about various avenues open for academic fraternity to make use of technology and reach student community at large. She discussed about different options available to a faculty and explained the skills that are required for development of such courses. 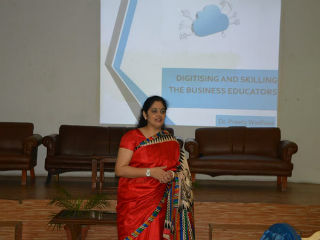 Her session was very informative in terms of all possible avenues that she discussed. 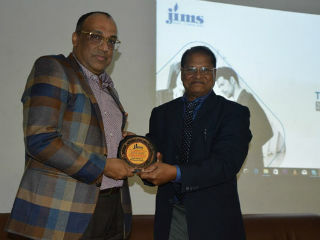 Dr. S.K.Jain highlighted the importance of ‘Intellectual Property Rights’ for Business School faculty, as it is a valuable asset. He discussed that public-funded research in India is important even though 74.1 percent of total R&D expenditure is borne by the government, although India’s R&D expenditure as percentage of its GNP is rather low by international standards. He explained that an extensive network of government funded institutes of higher learning, universities, institutions and laboratories are actively engaged in teaching, training and research. He said that the recent trends of rising patenting activity are not withstanding and highlighted that 75% of all patents granted in India are to foreign citizens, which is a cause of concern for Indian Researchers. 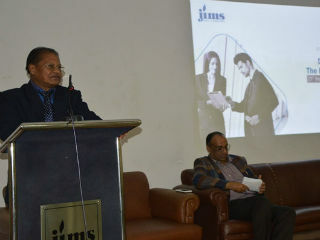 Dr. R.K.Sharma explained that Econometrics is the application of statistical methods to economic data and is described as the branch of economics that aims to give empirical content to economic relations. More precisely, it is "the quantitative analysis of actual economic phenomena based on the concurrent development of theory and observation, related by appropriate methods of inference"
He conducted two sessions in Computer lab. First on ‘Regression Analysis’ and second on ‘Time Series Analysis’ using ‘E-Views’. The session was well appreciated by participants, who said that it was a good learning experience and demanded more of such sessions in future, as these ware beneficial in their research endeavors. 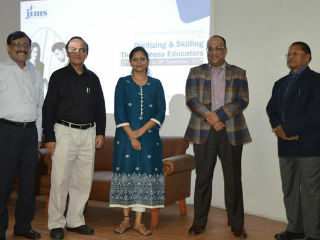 Dr. Singhvi talked about the widespread use in case pedagogy in business as well as medical education. 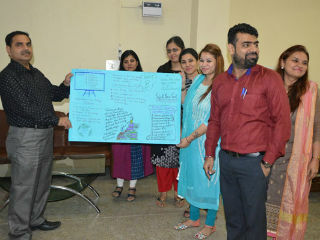 He explained that the case study teaching method is becoming an increasingly common teaching strategy in business education. It is a highly adaptable style of teaching that involves problem-based learning and promotes the development of analytical skills. 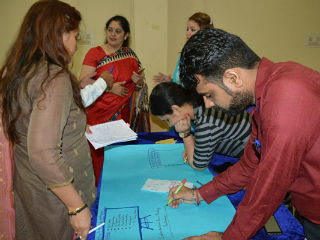 By presenting content in the format of a narrative accompanied by questions and activities, promotes group discussion and solving of complex problems, case studies facilitate development of the higher levels of Bloom’s taxonomy of cognitive learning; moving beyond recall of knowledge to analysis, evaluation, and application. He highlighted that case studies facilitate interdisciplinary learning and can be used to highlight connections between specific academic topics and real-world societal issues and applications. This was a thanks giving session to all participants, resource persons and organisers. This session was chaired by Dr. J.K.Goyal, Director, JIMS. Certificate distribution followed vote of thanks by the organiser Dr.Preety Wadhwa. 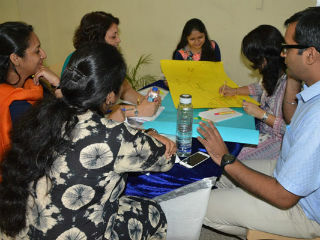 The session also included experience sharing by different participants. It was a happy ending of a week-long Faculty Development Program, which was aimed at strengthening teaching and research skills in the contemporary and emerging areas of management and exposing participants to recent requirements / developments in teaching and research methods.